Eight years ago, Zhao Liu was traveling back to Shenzhen to live a good life with his father and stepmother. Along the way, they were involved in a serious accident on the Northern Guangdong Expressway. A big truck lost control and was unable to stop because it was loaded with excessive amounts of sodium nitrite. The truck crashed into a van in front of it and caused an eleven vehicle pileup. Four of the eleven vehicles exploded and caught on fire. All eight people died in those four cars. 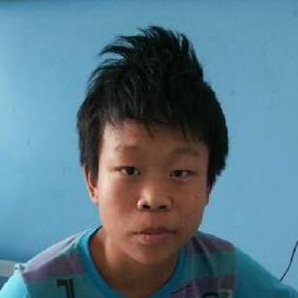 The fire department personnel searched for thirty minutes under a slope and found Zhao Liu. He was in very serious condition and had a concussion. His burn injuries covered sixty percent of his body. He had ten percent of his body in second-degree burns and fifty percent with third-degree burns. The bones on his left leg were exposed. After sixteen surgeries, with the help of Yue Bei People's Hospital, Zhao finally went home and stayed with his grandmother. Zhao and his grandmother receive 380 yuan and 360 yuan respectively each month for well fare. The money is not enough to pay for his school meals, which are 1,500 yuan per semester, not to mention his upcoming treatment fees. Thanks to the volunteers from HandReach, Zhao was accepted by Shriners Hospitals for Children in Texas. 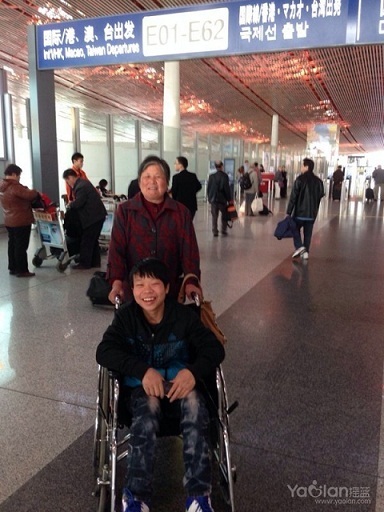 Zhao and his grandmother came to the US for treatment on Nov. 8, 2013. Today, I received Gao's email saying that Zhao received surgery on his stump. The reason for the surgery is because the stump always bled from frictions and it made Zhao very prone to have infections. The surgery has just finished. Dr. Huang said that Zhao needs to stay at the hospital for several more days. Zhao Liu, Zijun Qiu and Bosheng Mao's families all went to the hospital! Thanks to Mrs. Huang and "Loving Moms" on the island, they arranged for the hospital vehicle to pick up the families. They helped the families settle down and took them to eat a meal. After a long flight, Zijun and Bosheng slept early. I heard that only Zhao was in high spirits. In the next few days they will settle down and start checkups next Monday.